Carving involves cutting with sharp tools. If you want good carvings, you need well sharpen tools. Learning the correct way to sharpen will save you time and money, while increasing you enjoyment of actually carving wood. During the course of this project I had the chance to get involved with knife designer Mike Komick of British Columbia. I found him to be very knowledgeable and when he offered to send me some information on tools and sharpening, I readily accepted. I was originally going to include this info in the previous chapter, The Wonderful World of the Workshop, but after realizing how valuable this information would be to other carvers, I decided to only do some minor editing and to give Mike his own chapter. 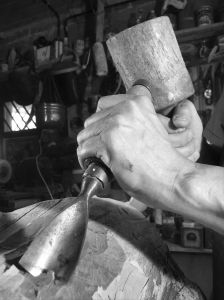 Many a prospective carver has fallen by the wayside as the result of dull edges and the inability to sharpen them. Sharp edges, whether they be on knives, chisels, gouges or groovers, greatly enhance carving pleasure and provide more satisfying results. Some carvers resort to throwaway blades to avoid sharpening. Even throwaway blades can be made razor sharp with the following procedure. Having a sharp knife or any other carving tool is one of the most important necessities of carving. A dull blade will tend to slip off the wood and cut you more easily than a sharp blade. A sharp blade will penetrate the wood rather than jump off into your hand. A dull blade will cause you to lose interest in your carving. Need I say more? As I meet carvers in our store and in my travels, I find that many, many carvers do not know how to sharpen. There are many schools of thought on this subject and I am not here to criticize anyone's methods. We are not criticizing anyone else's sharpening methods here. We sharpen hundreds of tools every month and will tell about our methods. We use methods that will allow you to maintain sharp tools in the minimum amount of time and get you back to carving sooner. We suggest you insist that your tools be sharp when you buy them. If not, then find an experienced carver to sharpen them. We will sharpen them for you (free - for a reasonable number) if you bring them by or mail them to us. A sharp tool is must to carve. You are more likely to cut yourself with a dull tool and you will probably become discouraged and quit if you have to care with dull tools. Many beginning wood carvers ask for tips on how to get started of right with wood carving. The Number 1 most important thing that a wood carver can do to ensure that they are successful at wood carving, is always have SHARP tools. Everyone agrees that a sharp knife or tool is necessary for good clean cuts with woodcarving tools. Like sharpening procedures, there are as many opinions about honing techniques as there are people offering their opinion. What follows are my thoughts and this is what works for me… in fact, it works very well for me. Sharpening woodcarving tools is one of those issues that you can get hundreds of opinions on, depending on how many woodcarvers you ask. While I don't recommend any one way over another, I would suggest that you spend some time learning to sharpen your tools by hand before attempting to use power. This way you will get a better understanding and feel for the tools and the type of edge needed before running the risk of "burning" the edges of your valuable tools.